THE EXHIBITION I REFERRED TO YESTERDAY WAS THRILL ME EVERY DAY: THE CELIA DUNLOP COLLECTION AT THE NEW DOWSE. IN 2005, CELIA PURCHASED THREE SMALL WHITEWORLD DRAWINGS FROM JANNE LAND IN WELLINGTON. I STARTED THE SERIES IN LATE 2003, AFTER RETURNING FROM A RESIDENCY IN SCOTLAND, AND TRAVELLING THROUGH THE USA. BELOW, I'VE MADE A MONTAGE OF ALL THE DRAWINGS TO DATE. THEY COME IN BLOCKS AS I QUICKLY GET BORED OF DOING THEM, OR LOSE THE SIGHT OF THE IDEA, BUT NEW ONES KEEP POPPING INTO MY HEAD. I GUESS I'M STILL NOT ENTIRELY SURE WHAT THEY ARE ABOUT BUT THEY MAKE UP AN INTERESTING BUNCH. 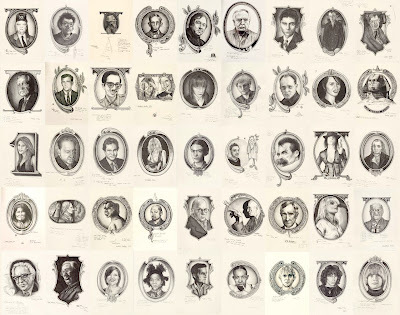 AT PRESENT, I'M DRAWING THE 27 CLUB, THE STARS THAT DIED AT 27 YEARS OF AGE. SOME OF MY FRIENDS I WENT TO HIGH SCHOOL WITH STILL TALK ABOUT THE PHENOMENON, AS KURT COBAIN DIED WHEN WE WERE IN OUR 7TH FORM YEAR.